Having different sauces for different dishes takes up time, space and increase wastage. Knorr Chicken Gravy is flavourful on its own. It is also a versatile brown sauce to complement all your dishes. All food additives are of plant, animal and synthetic origin. May contain traces of cereals containing gluten, milk, fish, crustacean, mollusc, soy, peanut and tree nuts. 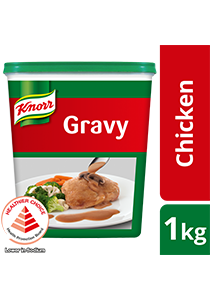 Knorr Chicken Gravy Mix contains real chicken meat and is now in an instant formulation, giving you the natural taste and aroma of chicken in just 3 minutes! 1. Dissolve 50g of Knorr Chicken Gravy Mix in 500ml of hot water.